Having a strong affection for roasted cauliflower and Middle Eastern foods, I adore this recipe. I love a salad that has enough going on that it could be a light lunch. This one has nuts to give it a bit of protein, and the yummy sweetness of the pomegranate. Once you’ve got your cauliflower roasted, it is quick to make. I kept it as leftovers for my lunch, but added the hazelnuts just before I ate it so they would retain their crunch. The recipe is from Yotam Ottolenghi’s Jerusalem cookbook – love this book! I was wary of the cinnamon and allspice, but I put them in anyways and the salad was delicious. 1. Heat the oven to 425F, then mix the cauliflower florets with 2 tablespoons of olive oil, 1/2 teaspoon of salt and some pepper. Spread on a roasting pan and roast in the top of the oven for 25-35 minutes. The cauliflower should have crispy edges and some if it should have turned brown. When it’s done, put the cauliflower in a large bowl and let it cool down. 2. Lower the oven temperature to 325F and roast the hazelnuts on a baking tray for 17 minutes. Let the nuts cool a little and then chop them coarsely. 3. 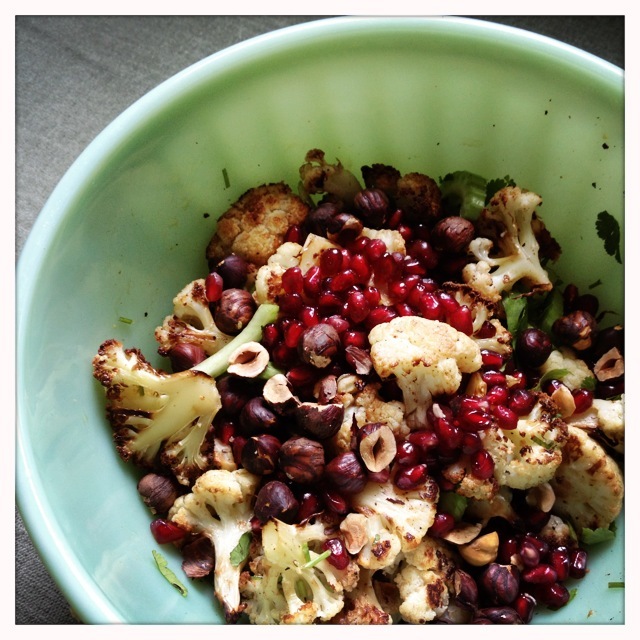 Add the parsley and pomegranate to the cauliflower. 4. Combine 2 tablespoons of olive oil, cinnamon, allspice, vinegar, maple syrup, and a little salt and pepper. Combine, then pour over the salad. 5. I like to add the hazelnuts just before serving so they remain crunchy. Serve at room temperature.